The mission of Benicia Community Gardens is to support local food security by helping local citizens establish and care for gardens that provide fresh food, fellowship and discovery, thereby strengthening community resilience. 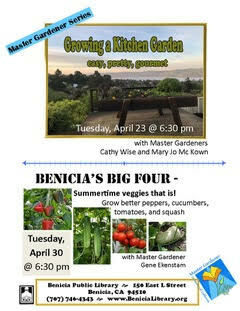 Join Swenson or Avant Garden and enjoy the harvest! There is a membership fee of $85 annually to help pay our monthly water bills and maintain the garden. We ask that you read the BCG Policies & Regulations which explains BCG’s mission, policies and gardeners’ responsibilities. If you’re interested in gardening with BCG, please follow the two steps below. We’d love to hear from you!